E&L® Insurance are a well known and established provider of personal line niche insurance and have been in business for more than 70 years. We pride ourselves in offering a first class claims and customer service, providing comprehensive cover and competitive premiums. We are regulated by the Financial Services Authority (FSA register number 202748) and are members of the Association of British Insurers as well as the Insurance Ombudsman Scheme. E&L® have been providing Touring Caravan Insurance for over 12 years, therefore are extremely experienced in this area of insurance. E&L® offers a wide range of Touring Caravan insurance which provides comprehensive cover for Fire and Theft through to European Travel. They also offer Lowest Price Guarantee, where if you find another policy cheaper elsewhere they will refund the difference. 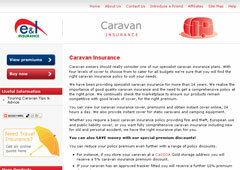 E&L® offers Static Caravan insurance to cover against accidental loss or damage through to public liability cover. E&L® also offer a Lowest Prices Guarantee where if you find another policy cheaper, they will refund the difference.